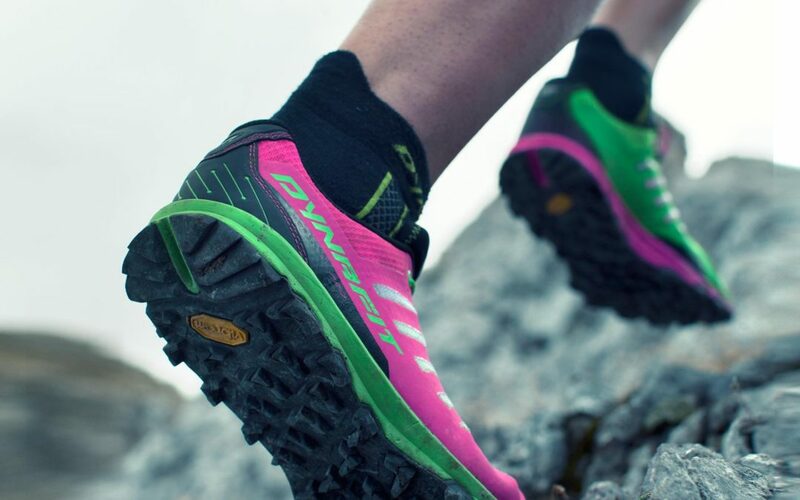 Dynafit’s new lightweight trail shoe, the Vertical Pro, is in and it looks sweeeet. This beauty (they are very pretty) comes in at just under 9 ounces, which is amazing considering that it has a decent amount of cushy midsole material, a rockplate, and a substantial vibram megagrip outsole. While this shoe is definitely light, it also has a very stable platform that make this shoe a viable option for longer runs or for runners who need more stability than other shoes in this category offer. Dynafit’s last is spot on, with a medium width forefoot, and snug low volume fit elsewhere. The shape of the last and the fit of the upper should accommodate a wide variety of foot shapes. The soft midsole material in this shoe differentiates itself form other shoes in this category which tend to be more firm. There is plenty of protection from the trail in this shoe but it doesn’t feel like you’re running in a brick when you are on firmer surfaces. Simply put, this is a great lightweight option for the hard-pack, rocky, and technical trails that are common in the rockies. Come on in and check out a pair today. !